Eastleach Martin (the southern half of the current Eastleach parish, including Fy- field) takes its name from the lovely ex-parish church on the south bank of the river Leach, which is dedicated to St Martin & Michael. St Martin’s Day is observed on the 11th of November – Armistice Day – coincidentally so, but perhaps appropriately for a soldier-saint. St. Martin’s Day, also known as the Feast of St. Martin, Martinstag or Martinmas, the Feast of St Martin of Tours or Martin le Miséricordieux, is a time for feasting celebrations. This is the time when autumn wheat seeding was completed, and the annual slaughter of fattened cattle produced “Martinmas beef”. Historically, hiring fairs were held where farm laborers would seek new posts. 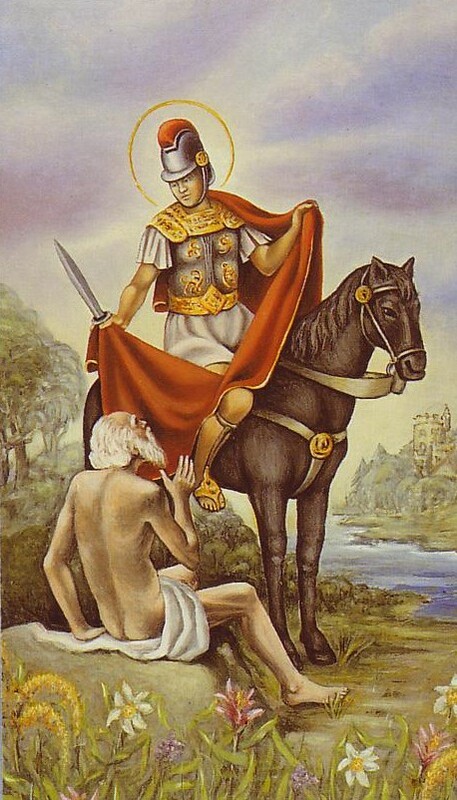 St. Martin was known as friend of the children and patron of the poor. This holiday originated in France, then spread to Germany, Scandinavia, and Eastern Europe. It celebrates the end of the agrarian year and the beginning of harvesting. Bishop Perpetuus of Tours, who died in 490, ordered fasting three days a week from the day after Saint Martin’s Day (11 November). In the 6th century, local councils required fasting on all days except Saturdays and Sundays from Saint Martin’s Day to Epiphany (the feast of baptism on January 6), a period of 56 days, but of 40 days fasting, like the fast of Lent. It was therefore called Quadragesima Sancti Martini (Saint Martin’s Lent).This period of fasting was later shortened and called “Advent” by the Church. The goose became a symbol of St. Martin of Tours because of a legend that when trying to avoid being ordained bishop he had hidden in a goose pen, where he was betrayed by the cackling of the geese. St. Martin’s feast day falls in November, when geese are ready for killing. St. Martin’s Day was an important medieval autumn feast, and the custom of eating goose spread to Sweden from France. It was primarily observed by the craftsmen and noblemen of the towns. In the peasant community, not everyone could afford to eat goose, so many ate duck or hen instead. In the United Kingdom, St. Martin’s Day is known as Martinmas (or sometimes Martlemass). It is one of the term days in Scotland. Many schools celebrate St. Martin’s day. Many schools are also named after St. Martin. Martlemass beef was from cattle slaughtered at Martinmas and salted or otherwise preserved for the winter. The now largely archaic term “St. Martin’s Summer” referred to the fact that in Britain people often believed there was a brief warm spell common around the time of St. Martin’s Day, before the winter months began in earnest. A similar term that originated in America is “Indian Summer”.